Potatoes have been subjected to some very unfair slurs by dieters over the years. They have been booted off the low calorie menu but it's the sauces, toppings and fillings that are the true culprits. The potato is actually a dieter’s dream. It’s a comfort food which is full of fibre and creates a feeling of fullness that helps to regulate the appetite. It contains virtually no fat and an average serving only clocks up around 116kcal. This compares very favourably to a higher calorie count for rice and pasta. If that isn’t enough, they are full of numerous vitamins and minerals such as Vitamin C and potassium. Potatoes contain lots of starch which makes them an excellent thickener for many dishes, especially low-fat soups. Sweat some onion, garlic and bacon in a hot pan using an oil mister. When they are lightly cooked, add 3-4 large, finely diced potatoes and 2 pints of skimmed milk. Heat the mixture through thoroughly until the potatoes is cooked through and soft. When you have reached this stage, you can either leave the potato intact to create a chunky soup or you can mix with a hand blender to create a smooth and creamy soup. Add as many different ingredients as you like and feel free to experiment. Good additions include sweetcorn, peas, leeks, ham or even some lightly poached white fish to create fishy chowder. The soup can be cooked ahead and reheated when required. Chips needn’t be off limits either, there is a low calorie alternative. Cut the required number of potatoes into chunky chips. Chunkier chips are better as they have a larger surface area and soak up less fat; they also tend to be fluffier and visually more satisfying if you are dieting. Place the chips in a deep bowl and drizzle with a teaspoon of olive oil. The oil only needs to lightly coat the surface of the chips, there should be no excess oil at all. If there is, drain the chips thoroughly in a colander first. Spread the chips across a non-stick baking tray and place in a hot (200ºC) oven. Bake for around 30 minutes turning regularly and cooking until they reach a deep golden colour. Serve and enjoy without any of the guilt. You can also carry on enjoying mashed potato. You just need to adapt it to match your dietary requirements. To make the mash creamy without any of the fat, replace butter with yoghurt or low-fat cream cheese. 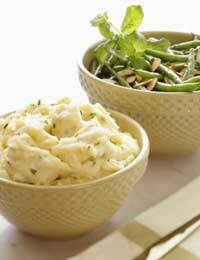 Liven up the mashed potatoes with lots of different ingredients. Roast a bulb of garlic for around 1 hour in a medium oven (175ºC) by wrapping the bulb in a parcel of foil with a misting of olive oil. When cooked squeeze the garlic cloves from their skins and cream together with half a teaspoon of salt. Mix into the mashed potatoes for a flavourful accompaniment to any grilled meat or fish. You can also snip a small bunch of chives into the mash for added interest. If you would like to add a cheesy tang to your mash add a tablespoonful of parmesan to the mixture. Parmesan cheese gives a strong cheesy flavour but uses a lower quantity of cheese to achieve the same effect. Parmesan has half the fat of most other cheeses. Don’t write potatoes off if you are following a low calorie diet. They are healthy, versatile and filling. Cook them in the right way and learn to adapt your favourite potato-based recipes to keep your diet varied and satisfying. You need to state how many calories this meal contains. Its an outrage, and im very annoyed! !